Distant visual acuity of 20/40 or better in each eye separately, with or without corrective lenses. If corrective lenses (spectacles or contact lenses) are necessary for 20/40 vision, the person may be eligible only on the condition that corrective lenses are worn while exercising the privileges of an airman certificate. The Snellen chart should be illuminated by a 100-watt incandescent lamp placed 4 feet in front of and slightly above the chart. The chart or screen should be placed 20 feet from the applicant's eyes and the 20/20 line should be placed 5 feet 4 inches above the floor. A metal, opaque plastic, or cardboard occluder should be used to cover the eye not being examined. The examining room should be darkened with the exception of the illuminated chart or screen. Failure to note and to require the removal of contactlenses. Acceptable Substitutes for Distant Vision Testing: any commercial available visual acuities and heterphoria testing devices. There are specific approved substitute testers for color vision, which may not include some commercially available vision testing machines. For an approved list, see Item, 52. Color Vision. Directions furnished by the manufacturer or distributor should be followed when using the acceptable substitute devices for the above testing. Each eye will be tested separately, and both eyes together. An applicant who fails to meet vision standards and has no SODA that covers the extent of the visual acuity defect found on examination may obtain further FAA consideration for grant of an Authorization under the special issuance section of part 67 (14 CFR 67.401) for medical certification by submitting a report of an eye evaluation. The Examiner can help to expedite the review procedure by forwarding a copy of FAA Form 8500-7, Report of Eye Evaluation, that has been completed by an eye specialist (optometrist or ophthmologist). 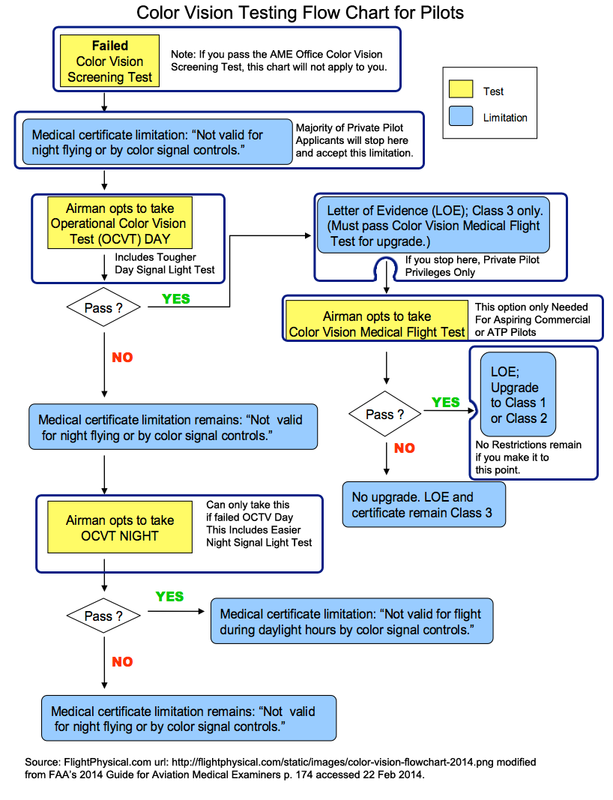 Note: In obtaining special eye evaluations in respect to the airman medical certification program or the air traffic controller health program, the 2014 AME Guide states that reports from an eye specialist are acceptable when the condition being evaluated relates to a determination of visual acuity, refractive error, or mechanical function of the eye. The FAA Form 8500-7, Report of Eye Evaluation, is a form that is designed for use by either optometrists or ophthalmologists. Amblyopia. In amblyopia ex anopsia, the visual acuity of one eye is decreased without presence of organic eye disease, usually because of strabismus or anisometropia in childhood. In amblyopia ex anopsia, the visual acuity loss is simply recorded in Item 50 of FAA form 8500-8, and visual standards are applied as usual. If the standards are not met, a report of eye evaluation, FAA Form 8500-7, should be submitted for consideration. This page discussed the Distant Vision portion of the Eyes & Vision section of the Fight Physical Examination required of pilots.